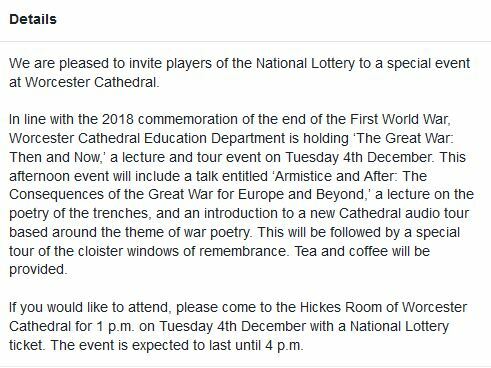 In line with the 2018 commemoration of the end of the First World War, Worcester Cathedral Education Department is holding ‘The Great War: Then and Now,’ a lecture and tour event on Tuesday 4th December. This afternoon event will include a talk entitled ‘Armistice and After: The Consequences of the Great War for Europe and Beyond,’ a lecture on the poetry of the trenches, and an introduction to a new Cathedral audio tour based around the theme of war poetry. This will be followed by a special tour of the cloister windows of remembrance. Tea and coffee will be provided. So the event is restricted to those over 16 years of age, and effectively bars members of those groups who consider gambling to be a sin, which includes Methodists, Mennonites and Quakers. It is a curious thing indeed for a cathedral to hold a ‘gambling only’ event – more so when that event is educational and commemorative. But what is more curious is how insensitive this is to those who have a gambling addiction problem. You might think this event has a perfectly harmless and modest entrance fee of a £2 Lotto ticket, but it is impossible to know how many of those attending might spend small fortunes on the National Lottery each week or on fixed-odds betting terminals or other forms of gambling. Would Worcester Cathedral host a ‘Bring-a-bottle’ educational event? It isn’t quite the same, of course: it is perfectly possible to bring a bottle of plonk to a function and not partake oneself, but in the case of a lottery ticket, one either has to gamble or procure another to gamble vicariously, which, for Methodists, Mennonites and Quakers inter alia, amounts to sin or leading others into sin. Ah, but this event is organised by the Heritage Lottery Fund (#HLF), you say, which, as the name suggests, is concerned with the distribution of lottery funds to thousands of good and worthwhile heritage projects across the UK. 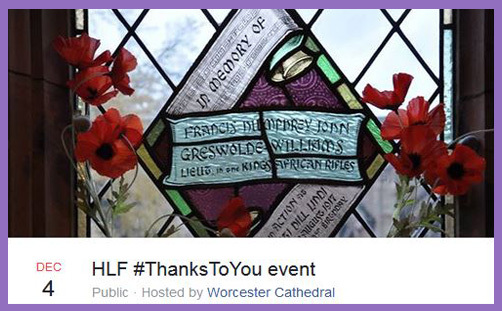 But here’s a thing: of every £2 spent on a National Lottery ticket, 56p (28%) goes to ‘good causes’, and the HLF receives just 20% of that ‘good causes’ cake, so (quick math) those who are forced to gamble in order to attend this event at Worcester Cathedral are donating a meagre 11p to the organisers. Frankly, the Cathedral would be helping the HLF far more (actually, 18 times more) if they made the entrance fee £2 and donated the lot to the HLF directly to channel to voluntary and community organisations across the UK. Unless, of course, the intention is to induce people into playing the National Lottery regularly in order to ensure the HLF has a steady stream of 11 pences from all those attending? For the Church of England, there is no moral impediment to gambling, provided it is done in moderation and there is no hint of fraud or corruption on behalf of the organisers. But while gambling is not a sin, it is an undoubted cause of social and psychological harm, for ultimately – and for the poor especially – a harmless flutter soon becomes a little more than one can afford to lose, and the motivation for playing soon turns from mere entertainment to the love of money. One might hope and expect a cathedral to reify a moral vision and exhort their communities to reflect on holiness and discern higher things. All events hosted within their walls should point towards an encounter with God; an invitation to reflect on all that is true, noble, right, pure, lovely and admirable: ‘if there be any virtue, and if there be any praise, think on these things‘ (Phil 4:8). We can engage in mission with all manner of artistic and metaphor-making events, and consider Jesus in fresh and illuminating ways, but none of these should be contingent on playing the National Lottery.